DutchCrafters Amish Shaker Pencil Post Bed has an elegant, simple look that will complement any home decor. This bed has four pencil posts with finial tops as well as a delicately arched headboard. Choose to have this Shaker Pencil Post Bed handcrafted just for you in oak, cherry or maple wood. Custom woods are available upon request such as tiger maple or quarter sawn white oak. The Shaker Pencil Post Bed has been popular for hundreds of years probably due to its classic look. 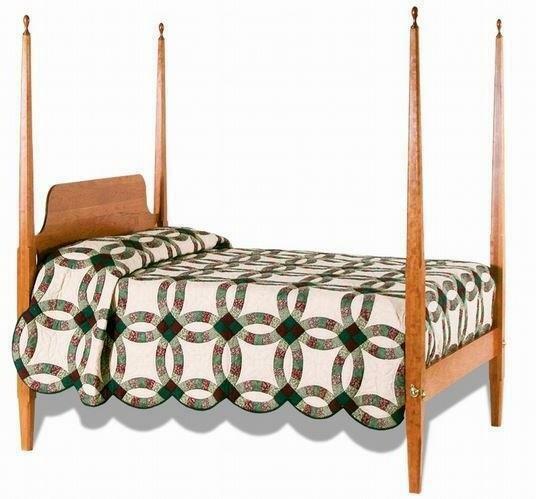 This Amish bed is sure to become a treasured family heirloom for the next 100 years! Mortise and tenon construction is used on the pencil post bed corners for added strength. The bed rails are bolted together with a through bolt and barrel nut. Each pencil post bed has five slats of which two have center supports on the queen and king beds. On all king and queen beds there will be 5 slats / 2 with props. Two slat supports are needed to meet the mattress manufacturers warranty requirements. They simply attach to the bottom of the slats. Our pencil post beds are expertly built for both beauty and durability. All of our Shaker bedroom furniture is made in America according to the traditional designs of Shaker furniture. It is made with the highest attention to quality in design, workmanship, wood selection and finishing. As with all DutchCrafters bedroom furniture, our pencil post beds are made of solid wood and built to last. Be sure to consider a night stand and bedroom case goods to accompany your Shaker bed. For furniture orders of $1000 or more, we offer the option of a 30% deposit to begin the order. Please call us at DutchCrafters, 866-272-6773 to speak with a furniture specialist who can answer your questions or help you to place your order for your pencil post bed. Rated A+ by the Better Business Bureau, DutchCrafters is a name you can trust. This Shaker Pencil Post Bed takes about 8-12 weeks to complete. Panel Footboard Height: 19 3/4"
Just a note to let you know the bed arrived. It's terrific; very well made. Many thanks. And we want you to know that Gary did a wonderful job of getting the bed to us. He was right on time, in fact a bit early, and kept us informed along the way. I'm sure it was not an easy trip. He is to be commended. Our compliments to him and his helper Jason.